Out My Front Door: "I Am Loki of Asgard" Loki Pendant Necklace Giveaway with Northern Lights Bridal! 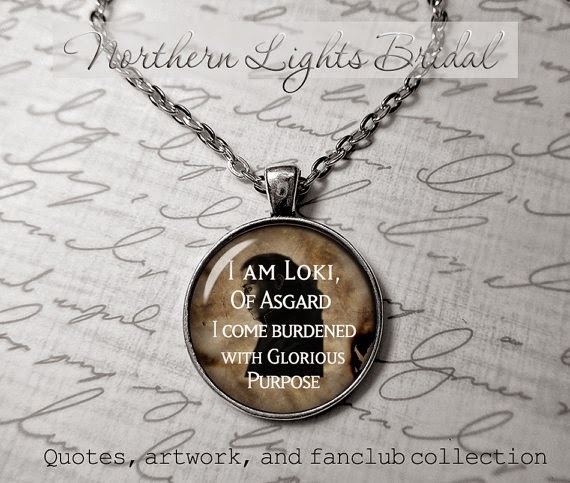 "I Am Loki of Asgard" Loki Pendant Necklace Giveaway with Northern Lights Bridal! Whoohoo! I have been so excited about this giveaway. Once I saw the pieces I got from Robin's shop Northern Lights Bridal (after falling in love with her great selection of fandom-based pendants) I knew one would be a perfect giveaway item. I later ordered the "I am Loki of Asgard" pendant, with another for the giveaway confident that it was the best one. This is my favorite quote of his, and I knew other geeks would love it. Even people who aren't geeks. You don't have to be a nerd to love Loki. This giveaway is hosted by me and Robin, and cohosted by Raewyn of Be a Warrior Queen, Nina from The Grand Adventures of Me, Cassandra from Cassandra M's Place, Kerry from Kerry's Habitat, Natalie from Natalie Patalie, and Tiffany from Endless Bliss. We are so excited about this giveaway! One 'I am Loki' Pendant Necklace is the prize. The giveaway ends at 12 am on the 20th! You can check out Robin's Etsy shop here. You can also check out Elora's review of her work in a post she wrote after she bought some pieces for last year's Christmas! My interview with Robin was supposed to be included with this post, but due to personal troubles the interview will have to be finished later when Robin finds the time. I'm so looking forward to that, and I really hope that things smooth out for her soon. ENJOY THE GIVEAWAY EVERYONE! The other cohosts have awesome blogs, and are really worth following! I always enjoy working with them, and the new bloggers I've met are super fun. You'll love their posts on geekery, personal stories, lovely styles--there's always something to have fun with! And you're welcome to share the giveaway! The more the merrier! I'm so excited to be a part of the giveaway!